This talented chicken video is a must see! If I had not seen this I would not have believed it! This little hen named Jokgu is making her claim to fame by playing America the Beautiful on a keyboard. Jokgu is a member of the all star chicken band called the Flockstars who are owned, clicker trained, and managed by the now famous, Two Creative Chicks (Shannon and Sadie). Jokgu was an all out hit on the America's Got Talent Show and On July 4th 2017, Jokgu was even featured on the Today's Show. What's even more amazing is that she can play other songs too. 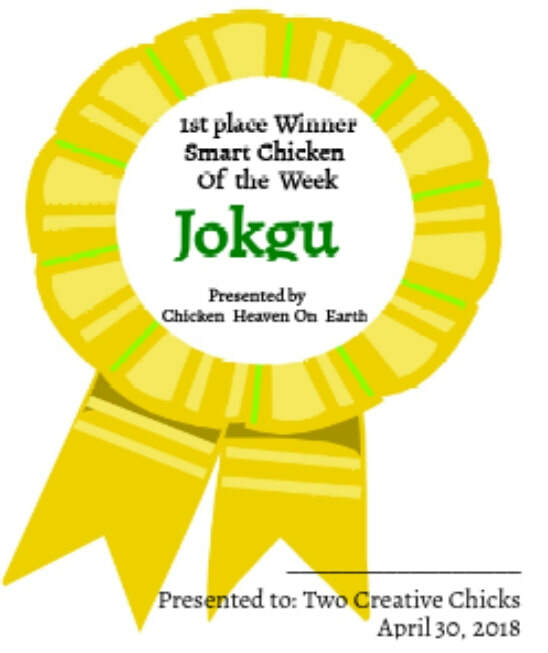 Jokgu won an award for Smart Chicken of The Week presented by Chicken Heaven On Earth on April 30, 2018 (See below). ​She is talented and beautiful, see her in action below. Jokgu can play America the Beautiful by tapping on the lighted keys. She doesn't miss a beat! She is so good at it that she even played in the America's got Talent Auditions and here she is! We search the world over to find the best and smartest chickens and we give the very best one's an award. Jokgu definitely falls into the Best of the Best Category and we are honored to present Jokgu and The Two Creative Chicks with this highly valued award. Congratulations and God bless ya'll. Hello World! I'm Jokgu of the Flockstars. Looking for easier, more affordable and better ways to take care of your chickens? We've got 'em! Check out our chicken care pages for all of your chickens needs, (backyard, pet chickens and commercial chickens). Easy way to feed your chickens with no mess. Easy to assemble. DIY chicken feeder kit. Meet The Flockstars, see them perform and view their award from Chicken Heaven On Earth. The Flockstars are the world's first all chicken band and they are really good too.